Aerosol spray removes fingerprints, dirt, grease and dust from most electronic equipment surfaces. Antistatic agent helps reduce dust buildup. Streak-free formula; excellent for electronics. Foaming action helps prevent running on vertical surfaces. Note: A minimum quantity of 126 must be ordered, and in units of 6 thereafter. 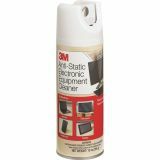 3M Anti-Static Electronic Equipment Spray Cleaner - Antistatic spray cleaner with citrus scent removes fingerprints, dirt, grease and dust from electronic equipment including PDAs. Unique antistatic formula in aerosol canister helps reduce dust buildup. Oil-free and wax-free formulation will not leave streaks.